As a dog lover, you can inconspicuously carry a precious remembrance of your beloved dog while displaying a beautiful piece of jewelry. Comes beautifully gift boxed with a 20" sterling silver chain. Pendant measures 3/4" x 1/2". Instructions and funnel for filling your pendant through threaded stopper are also included. 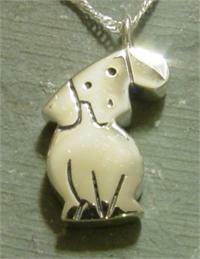 Engraving of your pet's name is also available for an additional charge and may be specified here when ordering pendant. Would you like your pendant engraved? UPPER or Upper & Lower Case Lettering?